Did you ever think that we would ever hear the term “papal retirement plan?” But we have with this pope, along with multiple media sources discussing what the Pope will wear and his shoes when he steps down from office today. While there is much speculation about why the Pope decided to step down as he did. I mean who doesn’t remember the media circus around the Vatican when John Paul II died, it seriously felt like the news people were saying, as Margret Cho put it brilliantly, “He’s not dead yet, but he might be after this commercial break.” So it is strange to the minds of lay people and some Catholics that a Pope would step down. But what we do have to remember is that first and foremost the Pope is the Bishop of Rome, and he has the right to retire. Also, something was told by a more religious friend of mine, the Pope isn’t the infallible word of God, unless he invokes “ex-cathedra” which has only been done once since 1870, and not by this current Pope. He is a man, not a superhero. I have always felt that the position of Pope has been treated like a king. While one can technically abdicate, nobody ever does, and that is why it is a shock when one does. 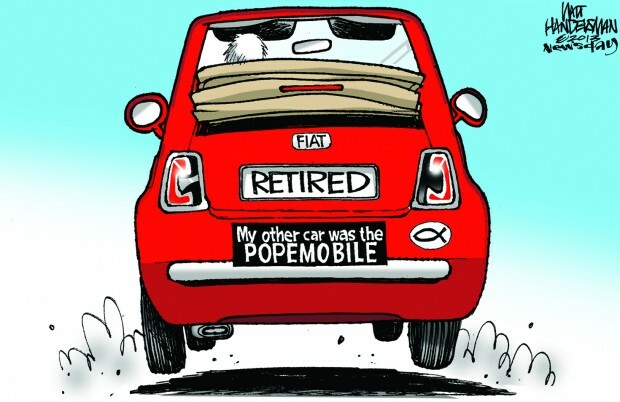 I am curious to see who the next Pope is and in what direction the church decides to go.